Last summer I came across this gem at a garage sale for $20!!! 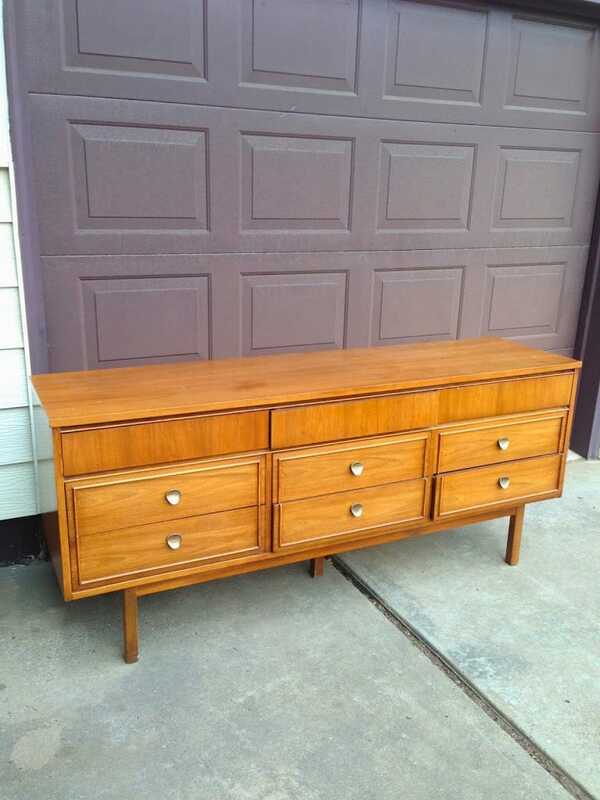 I found it just days after Matt had finally demanded, “NO MORE DRESSERS”, but this one was just WAY too good to pass up. I was willing to part with any of the others to keep this one. 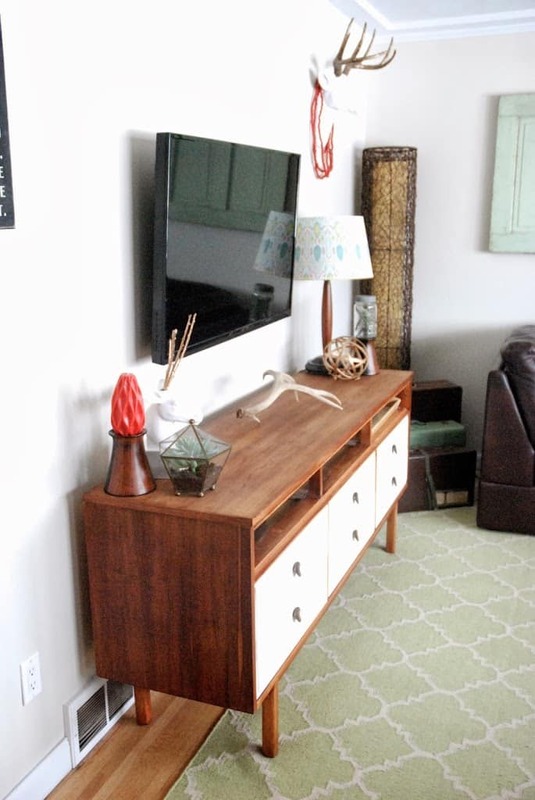 That day I convinced Jack that is was absolutely not a dresser but a TV stand, in order to keep him from going nuts! Here’s a little video of his reaction when I told him we had to go back to pick it up. But really… in all seriousness isn’t it great? It did have a very orange glossy tone to it though, so my first step was to use my old standby “Citristrip” on it. Here‘s my tutorial on how I strip furniture. After my typical stripping and scraping session it still had a LONG ways to go. 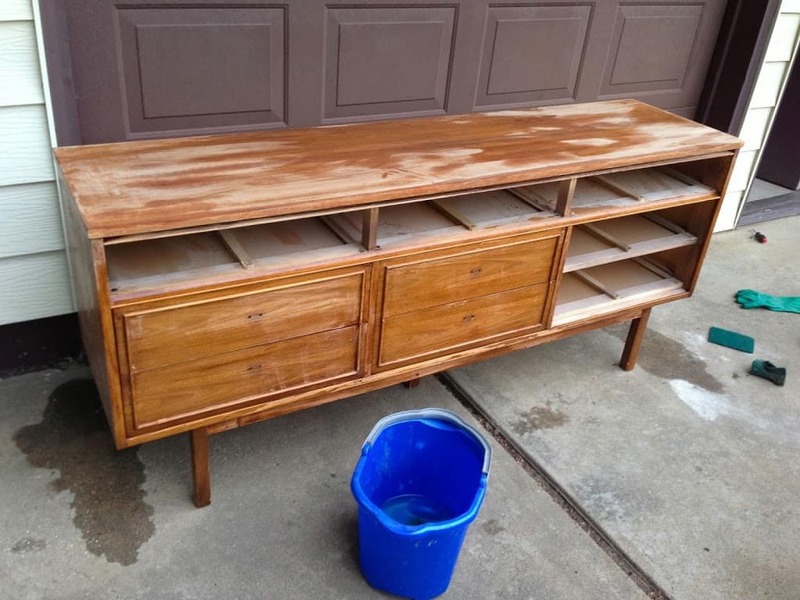 I scrubbed it with Citri-Strip remover and then spent HOURS sanding it. Probably 4 of 5 hours just to do the body. First I used a stain pre-conditioner. Then I stained it with Minwax PolyShades Olde Maple Satin. 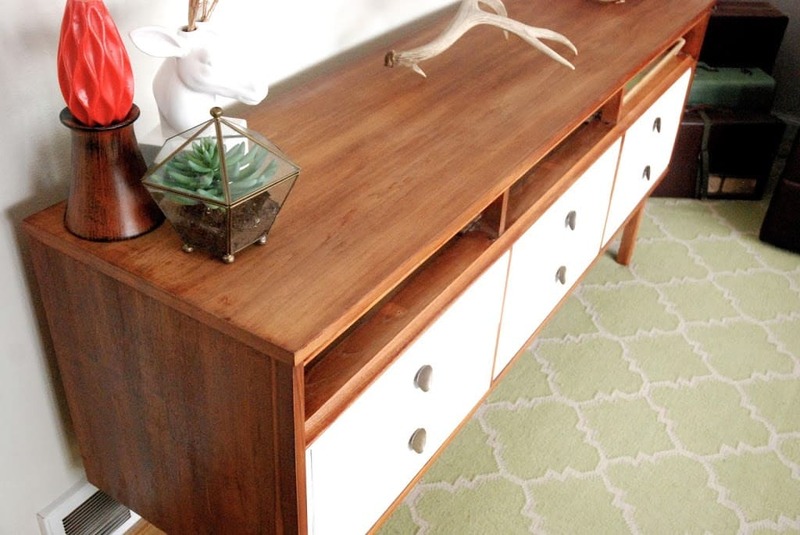 My favorite girl at the paint counter at Ace painstakingly helped me go through numerous stains until we found the one that would be the closest match to my mid-century end tables that I love. I’d say this is a very good match. Then I used Annie Sloan Pure White on the drawers and then attached the original hardware. 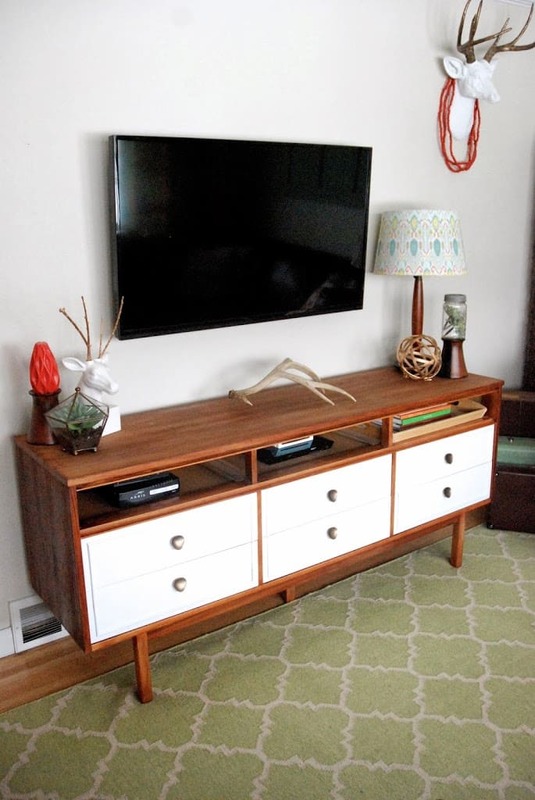 I love the way this mid-century dresser turned TV console turned out. There are definitely a few imperfections and initially I was pretty disgusted that I didn’t wipe the stain off soon enough. Now it has grown on me and I sort of love the little imperfections. 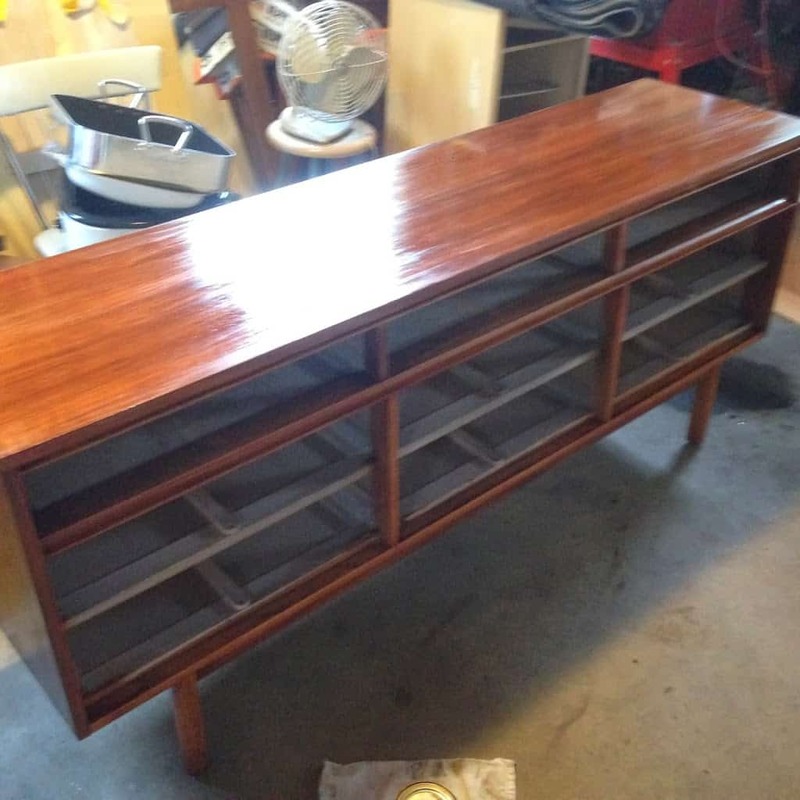 In order to make it into a media console I removed the top drawers and drilled holes though the back for cords. For our 30th Birthdays this year Matt’s mom and stepdad gifted us a new Vizo Smart tv that actually fits the size of the room. We went from a measly 28 inches to 42 inches! On Superbowl Sunday we finally drilled holes to hide the cords in the wall. 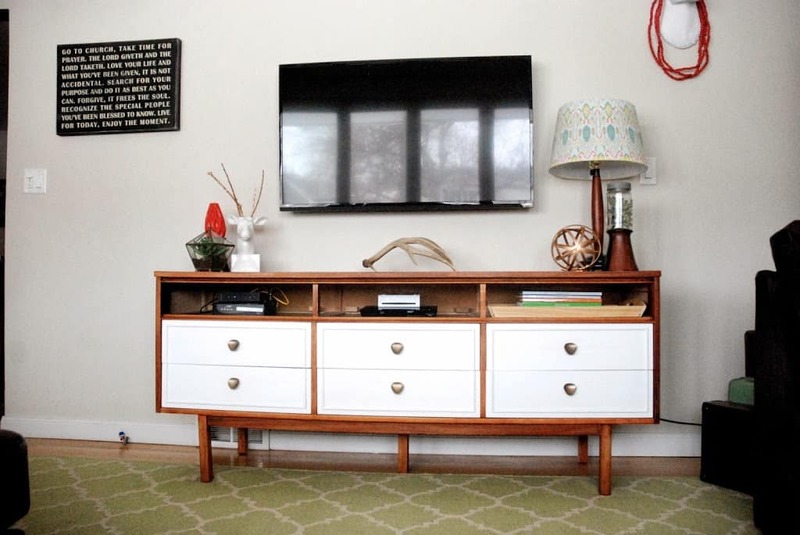 I’m still on the fence over whether it’s ok for the tv to be a focal point like it is here, or if we should try to hide it more like here, here, or here. Or maybe that’s just trying to hard? I’m on the fence. 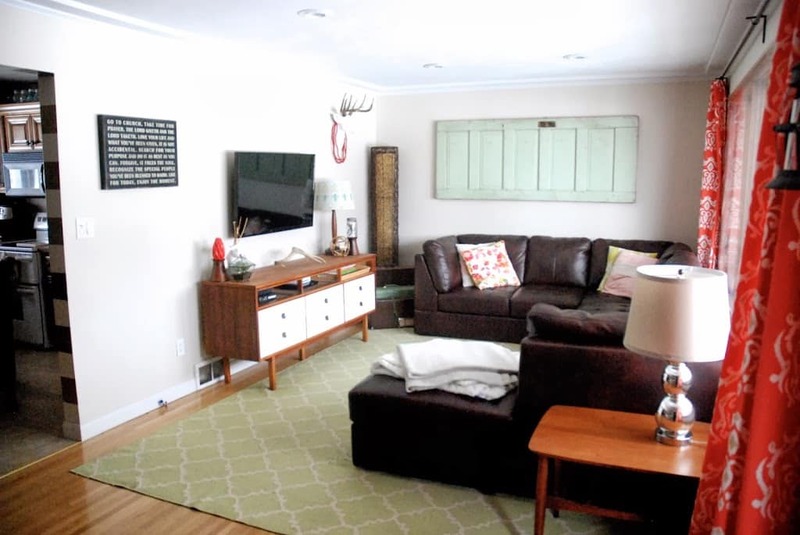 Here’s the whole room including the end table we matched. I just love the way the room has turned out with my vintage door, no-sew curtains, and even the peek of the gold striped opening. Hey! 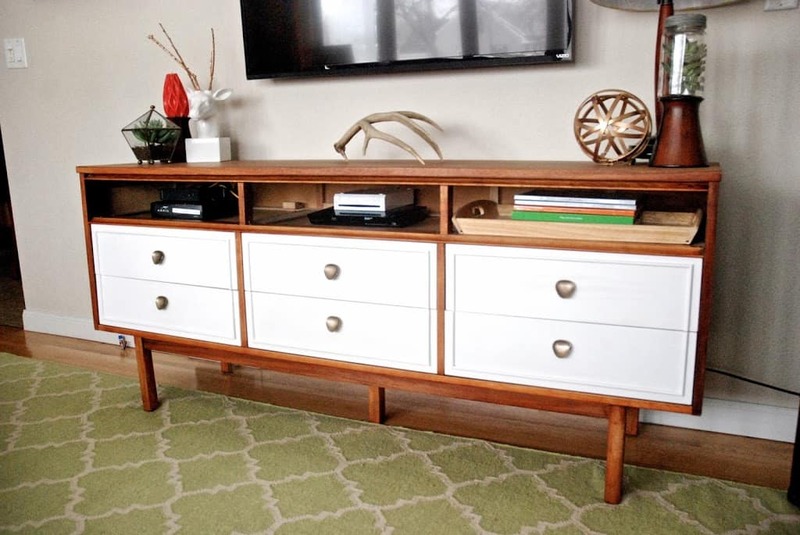 I love what you did with that dresser! 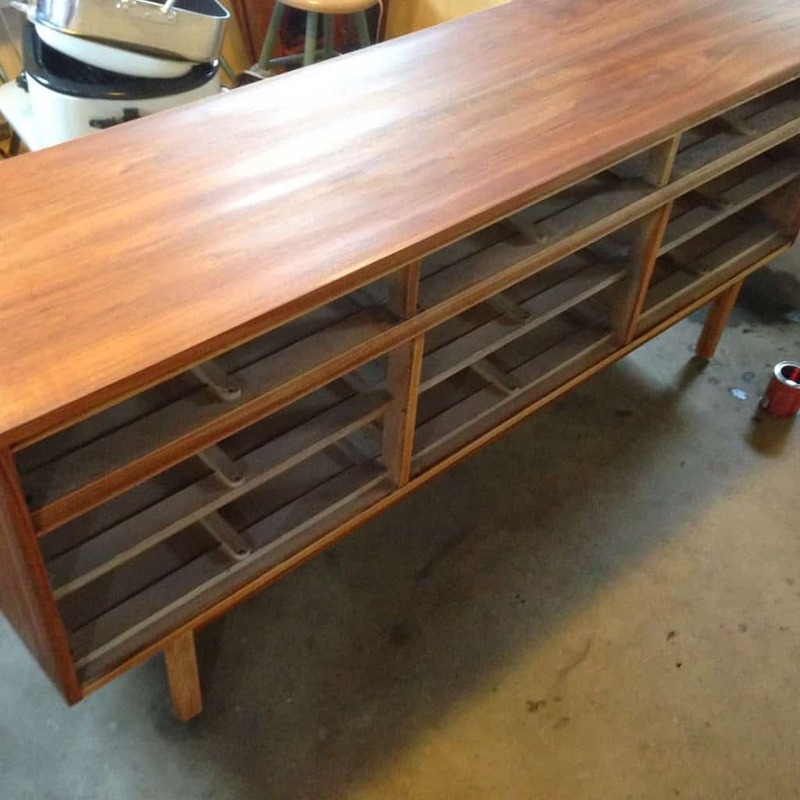 I was looking to do a similar project with an old office desk I have. I was just wondering if you did the same Critistrip process as in your Critistrip tutorial? 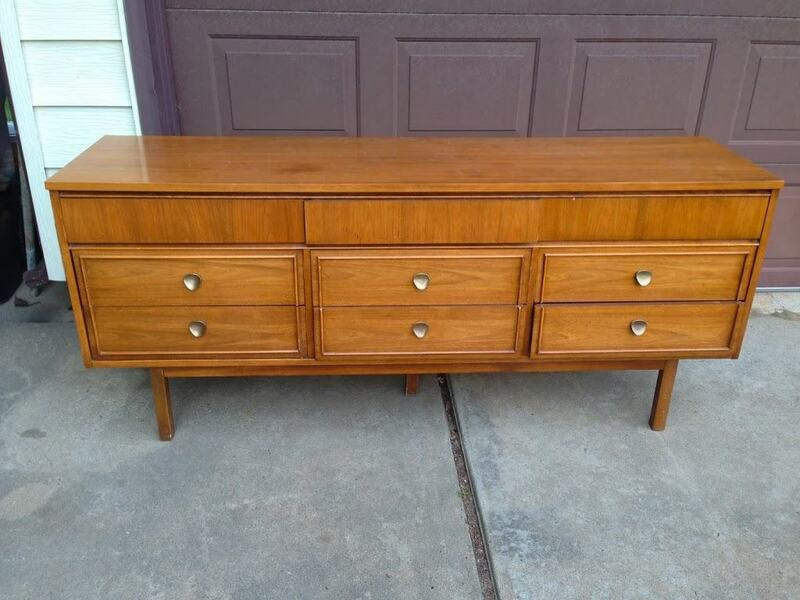 Did it make a different that this dresser was just stained and not painted? 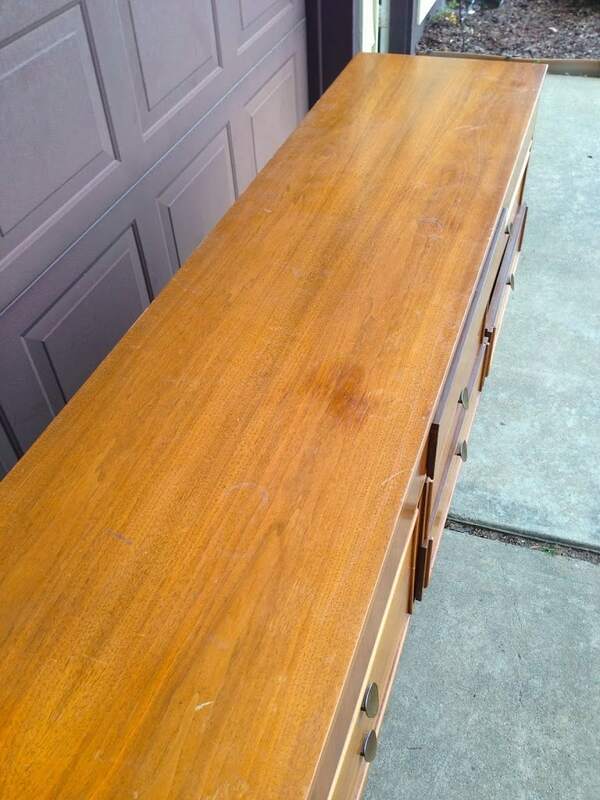 I was just wondering how much stripping you needed to do with the desk? Or was it mostly sanding? Thanks!